Game Calls.Net: The Choice of Pro Predator and Game Hunters Worldwide. Our Products Give You Results. Price: $399.95. Normally $499.99 in Camo. 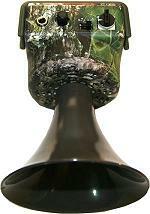 Check out our selection of the latest TE Digital Predator Calls. These miniature calls sport sound quality and loudness comparative to larger units yet fit in your shirt pocket. Comes with a 3 year manufacturers warranty, plastic carry case and 2 removable horns for directional calling. All units are 110db @ 10 feet with a standard 9-volt battery yet have long battery life, 112db @ 10 feet with external 12 volt battery. Sound cards are user changeable. Check out our selection of VHS videos for only 99 cents each! Supplies are limited and are selling out fast. View our selection of 99 cent videos! Click HERE to Browse America's # 1 Selection of Predator Hunting DVDs. Innovations from Nite Ize, Inc. Modernize your old lanterns and flashlights to the new state of the art L.E.D. bulbs available in standard PR Flange and Mini Mag type. Increase battery life from 5 - 14 times longer! Be sure to check out our new line of innovative mag lite and flashlight upgrade accessories, L.E.D. safety items, light up dog collars, knotless ropes, camo cell phone cases, tool holders & more. Click HERE to browse our Nite Ize L.E.D. and Accessory Products. Know your target before you pull the trigger! Gamecalls.Net selected as "Killer Web Site" by national radio talk show host Kim Komando.